June 2017 - Nomenclature updated. July 2018 - URL updated. April 2019 - minor updates in line with the RCR suite review. This procedure details the steps for managing complaints of research misconduct made against HDR candidates. This procedure enacts PPL 4.20.02a. This procedure is designed to determine findings of fact and whether research misconduct has occurred or not. Any findings of fact relating to research misconduct reached through procedures described in PPL 4.20.10b Research Misconduct - Higher Degree by Research Candidates - Procedures may then be addressed through the University’s provisions for managing academic misconduct via PPL 3.60.04 Student Integrity and Misconduct . Academic misconduct - is conduct on the part of a student that is defined as academic misconduct in section 6.1 of PPL 3.60.04 Student Integrity and Misconduct  Policy. Complainant - The person who has made a complaint. Designated Person (DP) - Pro Vice-Chancellor (Research) or other nominee of the Deputy Vice-Chancellor (Research). already considered by the University and satisfactory measures have been taken to resolve the matter. Good Faith – honest, sincere, without malice or ill intent. General misconduct - is conduct on the part of a student that would amount to general misconduct in section 6.2 of PPL 3.60.04 Student Integrity and Misconduct  Policy. Integrity Officer - the Deputy Dean of the UQ Graduate School, including their nominee as approved in writing by the Dean of the UQ Graduate School. Legally qualified - a person who holds a degree or formal training in law (e.g. LLB or JD equivalent) and/or a person admitted or qualified to be an Australian lawyer as defined by the relevant legislation. Office of Research Integrity - staff reporting to the DP with responsibility for management of research integrity and compliance. Organisational Unit Head - Head of School/Institute Director/or equivalent of the enrolling unit in which the HDR candidate is enrolled. Plagiarism - the act of misrepresenting as one's own original work the ideas, interpretations, words or creative works of another, either intentionally or unintentionally. These include published and unpublished documents, designs, music, sounds, images, photographs, computer codes and ideas gained through working in a group. These ideas, interpretations, words or works may be found in print and/or electronic media. (c) consideration of all relevant available evidence to assess an allegation of research misconduct. Redundant or duplicate publication - a publication that overlaps substantially with another work already published. Research Integrity Advisor (RIA) - persons with research experience, knowledge of the University’s policy and management structure, and familiarity with accepted practices in research who are appointed to provide advice on research integrity to researchers and students in accordance with the Code. The RIA’s role does not extend to investigation or assessment of the complaint. Research misconduct - a serious breach of the Code and/or the provisions in the Responsible Conduct of Research policy which is also intentional or reckless or negligent. Respondent - the person/s who is/are the subject of a complaint. HDR Candidate - a person enrolled as a student in a higher degree by research program at the University at the time of the potential research misconduct. The Code - Australian Code for the Responsible Conduct of Research  (2018) or any subsequent published revision thereof. This procedure applies to all HDR candidates and details the steps for managing complaints of research misconduct made against HDR candidates. Complaints of academic or general misconduct made against HDR candidates are addressed through the provisions for managing general misconduct via PPL 3.60.04 Student Integrity and Misconduct . The University considers complaints of research misconduct as a serious matter. Students must conduct themselves in a manner consistent with the standards set out in PPL 4.60.02 Higher Degree by Research Candidate Charter . (a) Procedures must be fair and just, and consistent with the requirements of procedural fairness. (b) The initial focus of decision-making is on whether there is evidence of alleged research misconduct. (c) Confidentiality must be respected and maintained by all parties within the constraints of the need to hear a research misconduct allegation and/or to fully investigate research misconduct allegations subject to any legal requirements for disclosure (including to the Crime and Corruption Commission) and in accordance with other University policies, procedures and guidelines. Staff involved in research misconduct or appeals processes must disclose actual, perceived or potential conflicts of interest (whether personal, financial or otherwise) as soon as they become aware of them according to PPL 1.50.11 Conflict of Interest . Positive efforts should be taken to restore the reputation of anyone alleged to have engaged in improper conduct of research when such complaints cannot be substantiated. (d) appeal a decision to a designated person or body who is not the decision-maker. 6.1 When an individual has concerns about the conduct of research involving an HDR candidate, including potential research misconduct, the individual is encouraged to consult and seek advice from a Research Integrity Advisor (RIA)  in relation to their concerns before electing an action in points 6.2 to 6.4 below. 6.1.2 The RIA’s role does not extend to assessment or investigation of the matter. Moreover, the RIA must not make contact with a person who is the subject of the concern or complaint, and must not be involved in any subsequent investigation or inquiry. 6.1.3 The RIA will explain the actions that a person who is considering making a complaint may decide to take. 6.4 Making a complaint to the Organisational Unit Head, and/or the Office of Research Integrity. 6.5 The complainant should provide all available information relevant to the complaint in their initial communication. 6.6 The person investigating the complaint may make a further request for information not previously provided from the complainant. 6.7 It is the responsibility of the recipient of a complaint to notify the DP, via the Office of Research Integrity, once a complaint has been raised about the conduct of research involving an HDR Candidate. 6.8 If a person reports a complaint of alleged research misconduct, an acknowledgment letter of receipt will be issued by the Office of Research Integrity as soon as practicable. (iv) a statement that the outcome of the University’s enquiries or investigations will not be advised to the complainant. 6.9 Depending on the nature of the disclosure, the complainant may be offered protection under PPL 1.60.03 Public Interest Disclosure . 6.10 If at any time during the operation of this policy or associated procedure, an HDR candidate withdraws their enrolment from the University, this does not remove the obligation to investigate concerns regarding the conduct of their research. 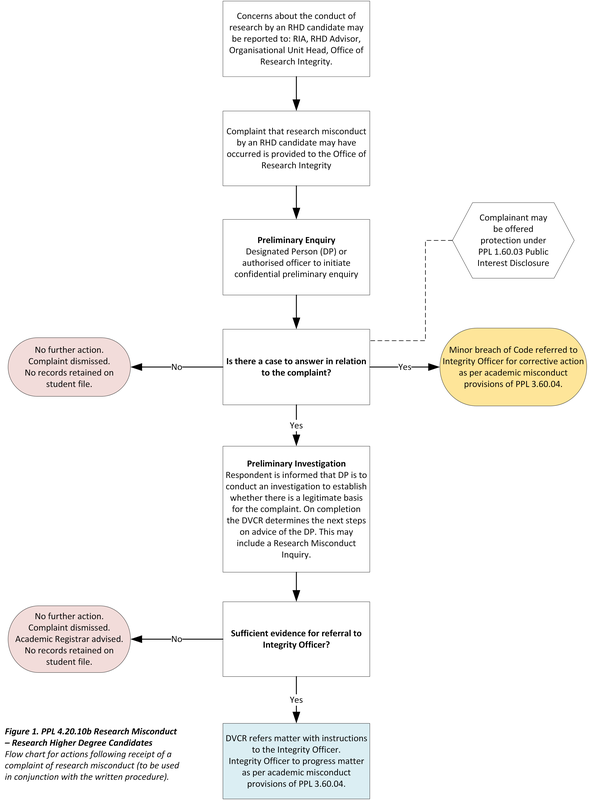 The procedure for dealing with complaints of research misconduct by an HDR candidate as reported to the DP is outlined in Figure 1. This flowchart is a guide and should be read in conjunction with these procedures. Nothing within these procedures precludes the DP or their authorised officer making reasonable efforts to resolve breaches of the Code informally provided these actions are consistent with the Code, PPL 3.60.04 Student Integrity and Misconduct  (Counselling for Alleged Misconduct) and PPL 4.20.02 Responsible Conduct of Research. 8.1 Prior to conducting an investigation into a complaint of potential research misconduct, as directed by the DP or their authorised officer, the DP or their authorised officer will make preliminary enquiries, under terms of strict confidentiality. 8.2 If it is found that there is no case to answer in relation to the research misconduct complaint(s) then no further action will be taken in relation to the HDR candidate who is the subject of the complaint(s). Where there is no case to answer in relation to the research misconduct complaint(s) , no records of any preliminary enquiry will be kept on the Student File. Where it is found there is a legitimate basis to a research misconduct complaint, the matter may be referred by the DP for preliminary investigation. 8.4 If, during the preliminary enquiry stage, it is identified that the complaint may extend beyond an HDR Candidate to encompass a member of their advisory team, or other staff members of the University, the preliminary enquiry and investigation process will be coordinated through the Office of Research Integrity in accordance with PPL 4.20.02b Managing Complaints about the Conduct of Research Procedure. If instead the preliminary enquiry demonstrates that the matter is contained to an HDR candidate/s, the DP may refer any preliminary investigation process to the Integrity Officer to lead in accordance with these procedures. 8.5 If, during the preliminary enquiry stage, it is identified that the complaint may wholly comprise, or include aspects of potential general misconduct, these general misconduct matters will be referred through the provisions for managing general misconduct via PPL 3.60.04 Student Integrity and Misconduct  to the Academic Registrar. 8.6 A student who makes a complaint or complaints which are considered to be frivolous and/or vexatious concerning the actions or omissions of an HDR candidate or staff member may be dealt with in accordance with PPL 3.60.04 Student Integrity and Misconduct  as a matter of general misconduct. 8.7 A staff member who makes a complaint or complaints which are considered to be frivolous and/or vexatious concerning the actions or omissions of an HDR student may be dealt with in accordance with the University’s provisions for managing misconduct or serious misconduct under the EA. 8.8 Nothing in this section prevents the DP from proceeding directly to Preliminary Investigation. 9.1 Upon decision to refer a complaint of research misconduct for preliminary investigation, the DP or their authorised officer in conjunction with the Director of the Graduate School must inform the HDR Candidate against whom the complaint is raised by issuing a notice that a preliminary investigation is to occur in accordance with the Code. 9.1.1 The notice of preliminary investigation to the respondent must be delivered within 10 business days after the decision is made to refer the complaint for preliminary investigation. (iv) the notice of preliminary investigation must provide sufficient detail to understand the nature of the complaint. 9.2 The DP or their authorised officer will conduct a preliminary investigation to establish whether a legitimate basis for the complaint of research misconduct exists. 9.3 The preliminary investigation will include an interview with the HDR candidate against whom the complaint is made. The individual may be accompanied by a support person who is not legally qualified. If the individual elects not to participate in the interview, the preliminary investigation will proceed regardless. 9.4.3 Should be referred to an inquiry panel in exceptional circumstances. 9.5 After providing advice to the DVCR, the DP or their authorised officer must not play any further investigative or decision-making role in the matter, except that he or she may be called to give evidence or expert opinion. 9.6 The individual who is the subject of a preliminary investigation, shall upon completion of the investigation, be advised in writing by the DVCR of the next steps in the process. 10.1 Where the DVCR accepts the recommendation of the DP or makes their own decision that further investigation into a complaint of possible research misconduct is warranted, an inquiry panel will be established. 10.2 Upon referral of a complaint of research misconduct to an inquiry panel, the DVCR in consultation with the Integrity Officer must inform the HDR candidate, against whom the complaint is raised, and their Organisational Unit Head that an inquiry is to occur in accordance with the Code. (iii) one member, should have experience on similar panels, or have related experience or expertise. 10.4 All members must, as far as possible, be free from bias and must declare any conflict of interest. 10.5 To achieve this membership, the University may draw on its own staff or externally as required. 10.6 An HDR candidate appearing before the research misconduct inquiry may be accompanied by a support person provided that the support person is not legally qualified. 10.7 The inquiry panel must abide by confidentiality requirements and must impress upon all persons involved in the inquiry their obligation to keep details of the investigation confidential. 10.8 The inquiry panel will provide a written report to the DVCR. The DVCR must consider the recommendations and determine whether the matter be referred to the Integrity Officer to initiate Academic Misconduct proceedings as per PPL 3.60.04 Student Integrity and Misconduct . 11.1.1 Subject to the requirements of privacy legislation and PPL 3.60.04 , the DVCR must inform all relevant parties of the findings from the research misconduct inquiry and, where appropriate, the actions taken by the University: relevant parties may include affected staff and students, research collaborators, including those at other institutions; journal editors; and professional registration bodies. The public record, including publications, may need to be corrected if research misconduct has affected the research findings and their disseminations. 11.1.2 Subject to the requirements of privacy legislation, if a case of research misconduct is found to exist, advice of this must be given to the relevant officer of any funding agency directly supporting the person involved, in accordance with the notification rules of the agency.